Westonia Primary school was officially closed in 2014 in it's 100th year of first opening. 100 year Cellebrations were held in March 2014 where past Students, Teachers, Principals, Staff, Bus Drivers, P&C members and Community were invited back to the school grounds. Past and present patrons of the school enjoyed reminiscing over memorabilia, listening to insightful speakers, cutting of the cake and much more. The Cellebrations were held from midday into the evening and Westonia saw well over 400 visitors to cellebrate and farewell the end of an era. With a wide range of programmes, pastoral care, specialist teachers, state-of-the-art facilities and links to tertiary and industry organisations, Merredin College offers opportunities for your child to pursue their learning and individual interests from Kindergarten to Year 12. It’s the best of both worlds — a college education to rival the city and the benefit of living in, and being nurtured by a country community. 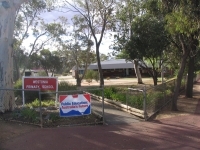 TAFE courses can be arranged through the Westonia Community Resource Centre and CY O’Connor TAFE in Northam.